This iPad® mobile digital device STEM Challenge project is a fun and creative way for students to demonstrate their learning or as an introduction to the lunar cycle. 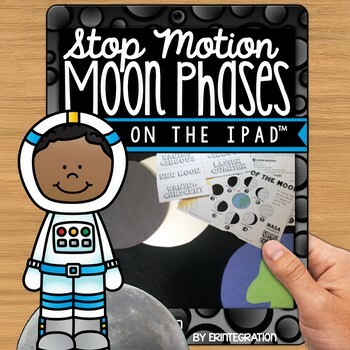 Students will use the enclosed direction sheets, QR anchor chart, planner and reference sheet to review the phases of the moon and to create a stop-motion video showing the lunar cycle on the iPad. Students can either use cut paper or Oreo cookies – your choice. I recommend having students work in teams of 2-4 to complete the project. ★ 3 Anchor Chart options with the Moon Phases and QR links to a NASA simulation on YouTube, View Pure (Ad-free) or QR free. 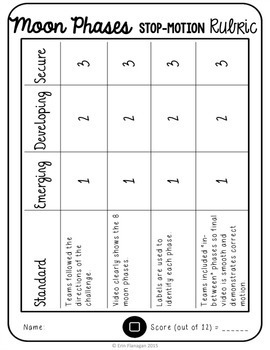 ★ 2 project direction sheets – one for using construction paper and one for using Oreos. Both work great for this project! ★ 1 project planner has students label the phases of the moon. 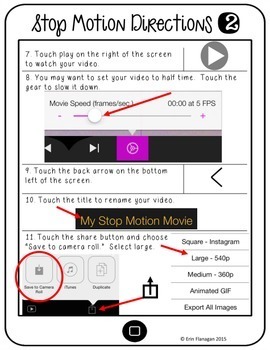 ★ 1 Stop Motion ready reference sheet – an outline of the basic controls of the app to display. ★ 2 step-by-step direction sheets with visuals to help students independently use the app from start to finish. ★ 1 set of moon phase labels for students to use in their videos. You will need the iPad app Stop Motion. A clickable QR code linking to the App Store® online store listing is included. Depending on which version of the challenge you have students complete, you will also need construction paper or Oreo Cookies.